Work experience; an omnipresent necessity for anyone who wants to get anywhere in life. For me, work experience is something I’ve come across through luck and hard work combined. University applications; job applications; internships and apprenticeships; all of them looking for someone with experience. The part about gaining work experience that I hadn’t expected was that it left me with as much personal development as it did skills. For me, this prospect of going out and getting work experience was nerve-wracking. I’d always been keen to get involved but having to rely on lifts broached its own difficulties; even when I had learnt to drive, finding somewhere that was willing to take on a wet-behind-the-ears conservation and ecologist was problematic. The first key moment in my becoming a volunteer was recognising the need to act upon every opportunity that was presented to me. I have always had an interest in entomology, so when I had the chance to do a research project through my college on the effects of neonicotinoids on honeybee communication, I took it. The second key moment was finding a Surrey Wildlife Trust (WT) Ranger who had the same interests as me. This could just be put down to luck and, partially, it is. However, a lot of time and effort into my research project, my own interest in the area of conservation as well as a lot of foot work all acted as precursors to getting the volunteer position at the Surrey Wildlife Trust. It was clear to whoever could put up with listening to me that the natural environment fascinated me. The entire summer of 2015 I went in and shadowed one of Chobham’s WT rangers. I took part in insect ID and transect surveys; fence and land monitoring and maintenance; volunteer group coordination as well as complaint management. Before I knew it I had achieved that fabled thing, the thing that when you’re younger feels as allusive as a real job and a mortgage; work experience. The thing was that the summer hadn’t felt like work at all. I’d been outside all day every day, encountering like-minded people and doing activities that taught me countless skills. I have learned a variety of things, from how to do maintenance checks on all the WT vehicles, dealing with angry members of the public to how to tell the difference between a Buff- and a White- tailed Bumblebee. The summer had opened doors to me, expected and unexpected. One of these was a will to expand a personal hobby; wildlife photography. I didn’t know when I agreed to go and meet at the Chobham offices of the WT that the summer would provide me with so much. Not only did I gain an insight into what I wanted to do as a career but it also helped foster different skills that I’d only just picked up; skills that would, in turn, help me move onto more exciting opportunities. Summer of 2015 spurred me into, in the second year of my university degree, really searching for that something special that I wanted to do. No more luck; it was time for some elbow grease. I became one of the leaders of the uni-based Expedition Society, and wrote an article on one university lecturers’ path into the field of research for another uni-based project and, most importantly, I went out every chance I could and practiced my photography. It was these skills, in addition to some admin work I had completed in college, which made me feel confident in applying to a summer expedition – and being accepted. The Bee-Elephant Enterprise (B.E.E Project) was a small project that had been, for the past few years, in the developmental stages. The purpose of the project was to work with rural farmers in Kenya to build beehive fences around their farmland. The bees that would then colonise the hives would act as natural deterrents to crop-raiding elephants that, year on year, left many of these farmers without any harvest at all. Finally, after years of building contacts and preparing for every eventuality, the project was finally at the stages of sending a team out to Kenya. Maybe I was lucky in this as well; not only did my timing in contacting the project coincide with an outbound group but it was also another project based around the behavioural aspects of honeybees. The team spent months preparing to go out. Dr Lucy King, the founder of the Elephants and Bees Research Centre1 in Mwobiti, Voi, kept us up to date with what work we would be doing whilst out there. Back at home we went on beekeeping courses, had lessons on cultural diversity as well as what to pack. The months slipped away until, eventually, B.E.E Project were heading out. The amazing part of this experience was that I felt like I was a small, yet integral, part of an organisation much bigger than myself. That and the fact that, as the pioneer group, we essentially had no idea what to expect, there were no guidelines borne out of previous experiences. The weather, the wildlife, the people were all a shock to the system. The heat, the diversity, the friendliness of it all had our group enamoured with the entire place from day one. Our group were treated as any intern at the centre would be; we had our group project of building the beehive fences as well as our own mini projects. These ranged from data collection and processing to working on the local school’s permaculture garden. These were all completely new experiences and, yet strangely, were everything we had expected them to be. Two full beehive fences later; a species-spots list including elephants and hornbills; a permaculture garden designed to show farmers how to utilise a constrained amount of space; lessons taught at the local school; honey and wax processed as well as countless data sheets of the locals farms filled in, as well as meeting some truly wonderful people and one truly epic month I would do it all again. Work experience on a grand scale; contacts made, lessons learnt, skills acquired and a real desire to understand and document the environment around me, all fashioned by the great outdoors and the wildlife we share it with. Now I have two summers which have built on each other. The past two years I’ve spent volunteering have helped create some of my most memorable and valuable experiences. The opportunities I’ve had have lead me to creating my own portfolio of wildlife photography, an achievement I hadn’t even considered when I first spoke to the Surrey Wildlife Trust. Work experience really is important but not just because it makes you look better on paper or makes you more employable; it means that you give yourself every opportunity to better yourself and achieve everything you knew you could, as well as somethings you didn’t. 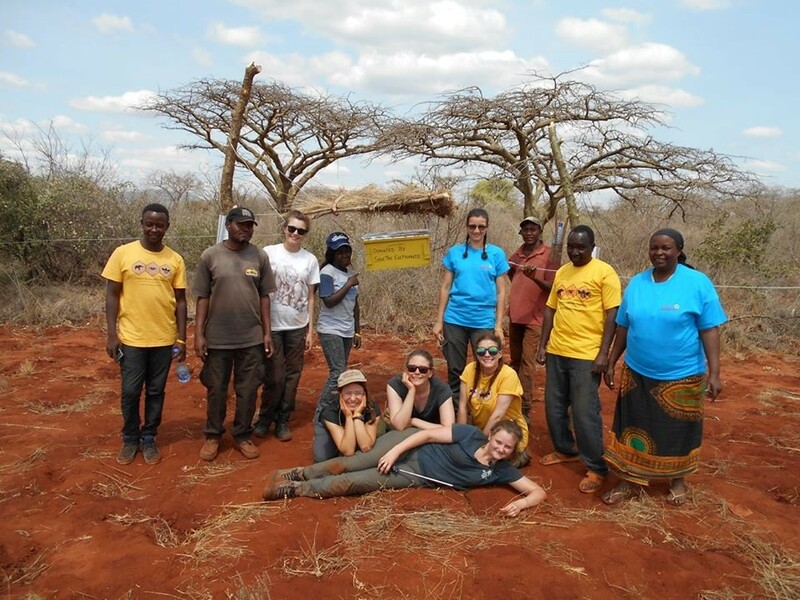 First completed beehive with the entire team at the research centre. Taken by Chris Iverson. Really interesting article, Victoria. Were the beehives successful in deterring elephants from raiding crops? The village that we worked with was right alongside the boarder of the national park- there was a lot of elephant activity all year round. The fences that have been established for a few years with several active beehives would often help in preventing elephant raids in the sense that the bees would, once the elephants had breached the wire barrier, scare the elephants away. The problem with this is obviously that there are still elephants trespassing on farmland but the important part is that the majority of the time they do minimal damage to the crops. Our fences won’t have active hives for at least the next year, until a wild colony inhabits the hives. Hopefully the team next year will let us know!